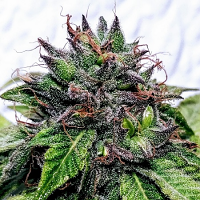 This new monster THC rich strain has been achieved by crossing Bruce Banner (Strawberry Diesel & OG Kush) and the legendary White Russian (White Widow x AK47). 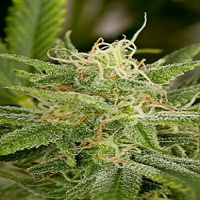 Bruce the Russian Feminized Cannabis Seeds by Cream of the Crop Seeds: This new monster THC rich strain has been achieved by crossing Bruce Banner (Strawberry Diesel & OG Kush) and the legendary White Russian (White Widow x AK47). She has a super fruity smell coming from her Strawberry Diesel roots, not forgetting the distinctive fuel edge coming through too. She grows tall and proud, and will produce very resinous buds. The smoke is a long lasting & well balanced with a relaxing body stoned combined with cerebral high. Treat her with love and she will produce some shirt busting yields; with a 9-10 week flowering time indoors, and mid-October if your outdoors. Bruce the Russian, she’s mean, and most certainly green!